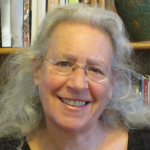 Denise Bergman is the author of the poetry books A Woman in Pieces Crossed a Sea (winner of West End Press’s Patricia Clark Smith Prize), The Telling, and Seeing Annie Sullivan, and editor of the anthology of urban poetry City River of Voices. Her next poetry book, Three Hands None, is forthcoming from Black Lawrence Press in early 2019. Her poems have been recently published in Poetry, Beloit Poetry Journal, and Paterson Literary Review. www.denisebergman.com.